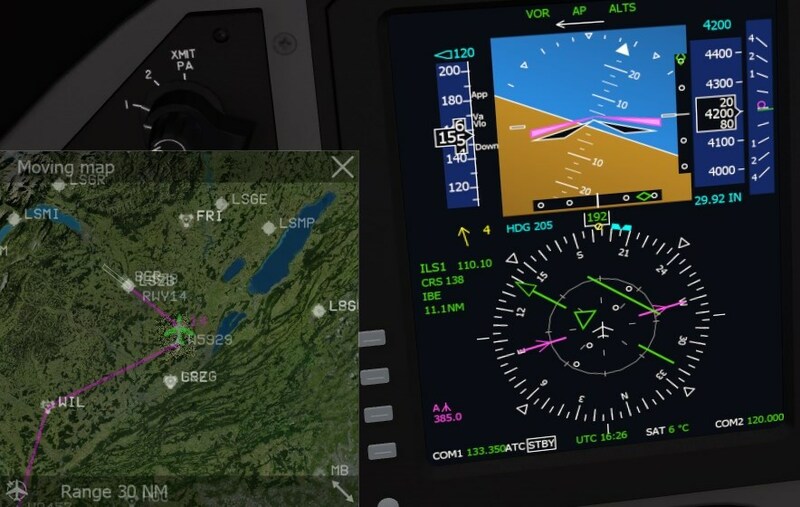 Computers have entered into cockpits with LCD-screens for displays, and advanced autpilots that can follow a whole route using GPS without need of VOR radio beacons. ILS is still often used for landing, but GPS enters here too. • Flight 3 in King Air 90 with glass cockpit. • Flight 4 in King Air 90 using FMS auto-LNAV. • Flight 5. About Airliners: Learjet, Dash Q400, B747... and Airbus 320 Tutorial, AFS2.
! Comments/corrections are very welcome - New topics for me, and I am only a sim-pilot! • Contact, see below! Fig 1. Flight plan Birrfeld to Bern-Belp, from previous webpage. A short route used for my test flights in AFS2. - Click för larger images! King Air-series are twin-turboprop aircrafts. They are faster and have higher climb rate than cylinder-engined planes like Baron 58. First King Air 90 was delivered in 1964. 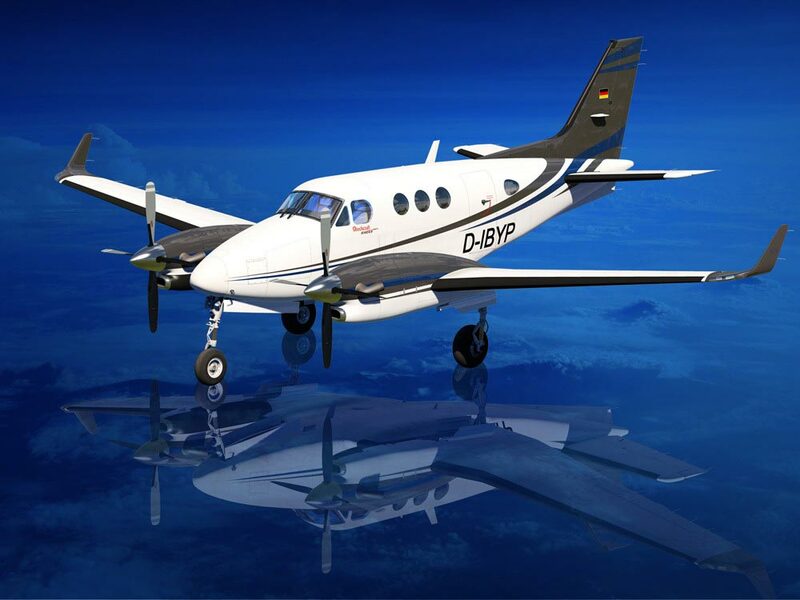 King Air series is the most produced twin-turboprop business aircraft model. It has glass-cockpit with Rockwell Collins Pro Line 21. We will start by using only its basic autopilot functions. PFD Primary Flight Display: Speed, Horizon, Altitude, HSI, and lots of settings info. MFD Multi Function Display - at present (9 Dec 2017) only one - no Weather, TopoMap, Hydraulics,.. 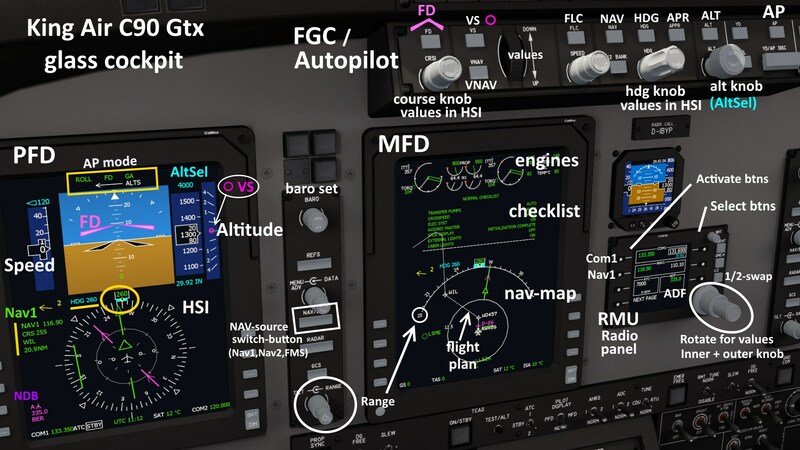 It shows: Engine instruments, Checklist, HSI 130°-arc and map with flight plan + nav objects. Knobs: mouse-rotate or click('press') to get standard- or now-values. Now lets try the advanced functions: Our flight plan is in the FMS computer and autopilot will do the lateral (horizontal) navigation all the way using GPS. We must manage: start, altitude and speed, and ILS activation. FMS Flight Management System, i.e. a computer with advanced functions for system display and navigation. * Nav1 - VOR1-nav or ILS1-nav. * Nav2 - VOR2-nav or ILS2-nav. - FD Flight Director - pink symbol that guides you if you want to fly manually along your flight plan. 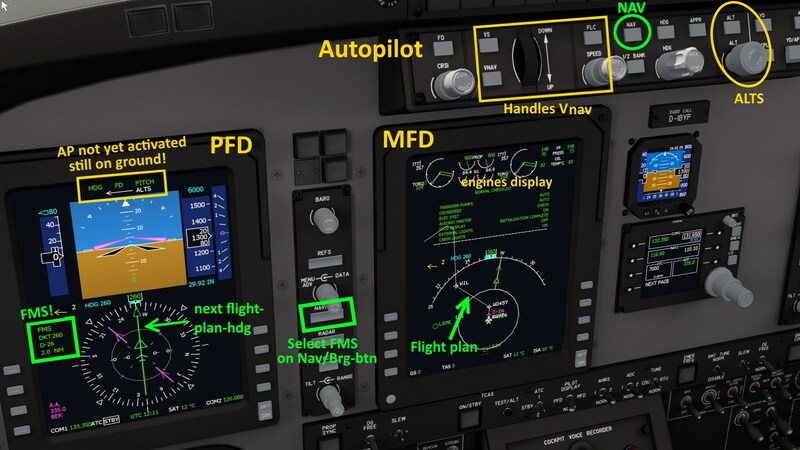 "FD" text in PFD-top shows pilot in charge! * FLC Flight Level Change - computer scheme. No throttle control in this AP. You must manage! - LNAV Lateral Nav - (horizontal nav). We will try a FMS-guided tour. Settings as in Fig K2. Fig K2. FMS activated, HSI green text! Autopilot will follow flight plan - after take-off and click on NAV! This sequence of images shows FMS in work. We start with AP-off, i.e. in FD-mode. After take-off and stabilizing we set AP on. First only pitch and roll control. Then click [NAV] to activate FMS - GPS-navigation! click [ALT] and quickly [VS] and rotate wheel UP to get 1000ft/min. Then lean back and follow FMS handling climb to 7000ft (ALTS), and making our three turns. 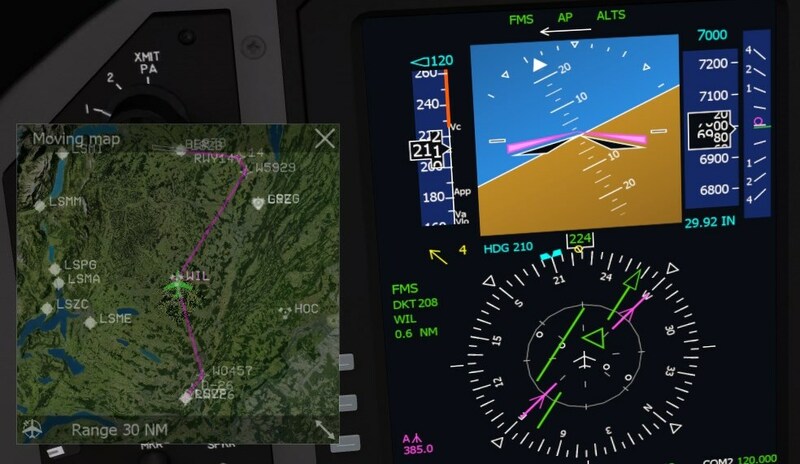 - Notice changes in AP-mode on top line of PFD! Started. AP on. First turn to the left. Climbing. Turn to the right at WIL. Have reache ALTS 7000ft. After turn 3 we want to catch Bern ILS-beam at 138°. We are on hdg 183° and can use [NAV] to catch beam (LOC). Then to catch glide slope we use [APR]. If all goes well we will approach runway and can let autopilot do a hard landing, or flare out when over threshold (AP off!). I had difficulties handling speed well. I ought to have memorized the V-speed above! Moving in to ILS. Turn left. 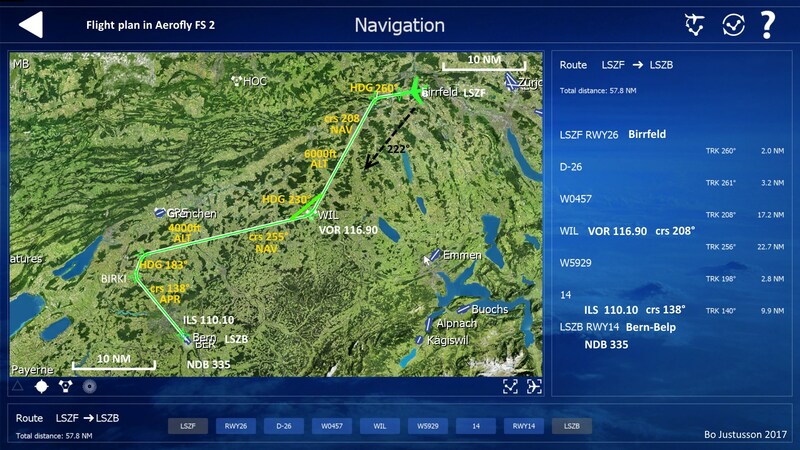 NAV with ILS i.e. slightly wider catch field. Remark: Now NDB 335 BER is set, late! Note the two Course Deviation Indicators, CDI, in the Attitude indicator: Green diamonds on black stripes with white dots. Baron similar but with HSI, King Air with a modern glass cockpit. 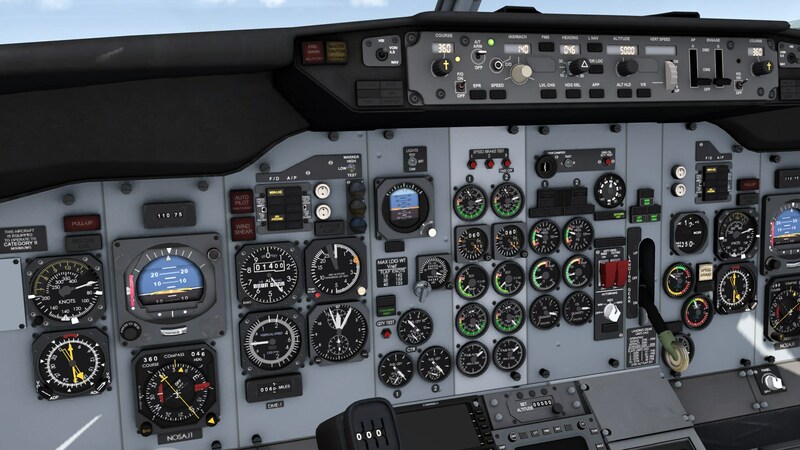 In AFS2 next choices can be Learjet 45 or Dash 8Q-400. Both have APs similar to King Air. - Learjet 45 is a very quick and agile, almost like a jet fighter. You should have a good joystick and handle with tiny motions! Learjet's cockpit is compact and one has a good view of all instruments in a sim-screen. - Dash 8Q-400 turboprop is slower and moves more gently. 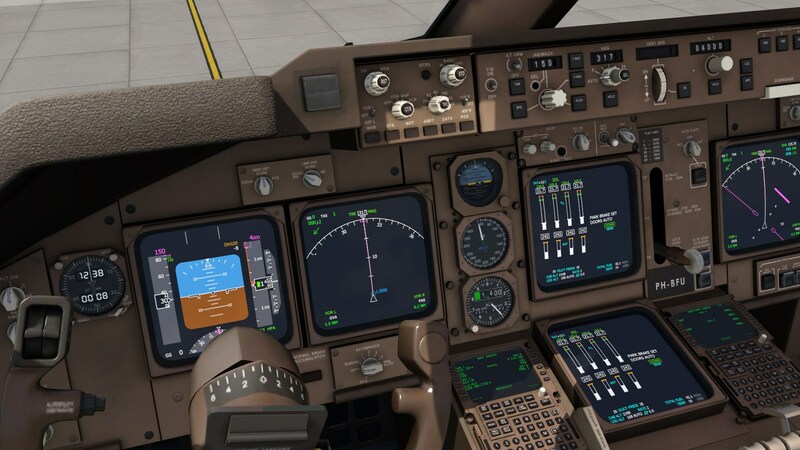 But, its cockpit has panels wide apart, making it difficult to use in sim-screen: when one turns a knob the changing digits are sometimes out of view. - The AFS2-manual for Airbus 320 is very pedagogic. - The manuals for Learjet and Dash contain lots of info on what a real pilot has to handle, which makes them a little difficult to read. Maybe will AFS2 split them into several parts (?). Fig. Learjet 45 instruments. Compact design - good for Sim with screen display! Fig. Dash 8Q-400 instruments. More spread-out. Requires zoom and pan in Sim! 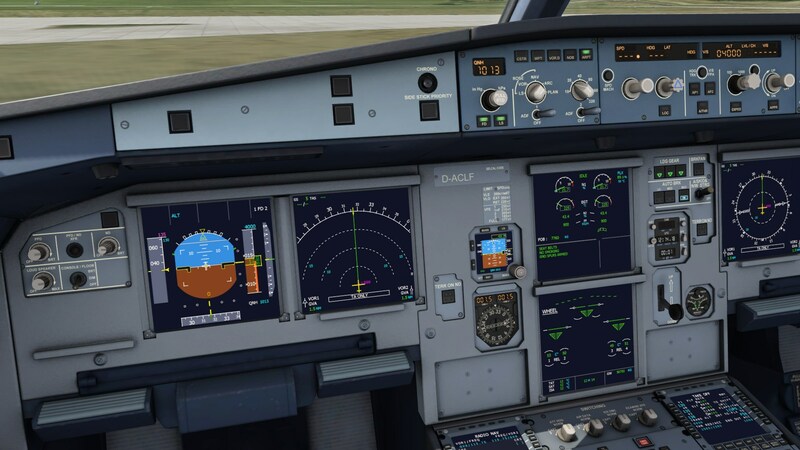 - Airbus 320 and Boeing 747 in AFS2 have modern autopilots that show digits close to each knob. - Boeing 737 in AS2 has old-style instruments and a modern autopilot. Lets you test flying as pilots did before glass cockpit! - very pedagogic and shows AP's advanced features. - main steps and flight plan shown here, the rest you find at AFS2 website. Flight 5 from Sacramento to San Francisco. - Start: Manual, significant speeds are displayed. - Cruise: Autopilot follows track (GPS), and you set ALTS to 12000ft. - Landing with ILS: Set ALTS to 2000ft. Autopilot computes Top of Descent (ToD), tunes in and lands aircraft all the way to Rwy, with flare! 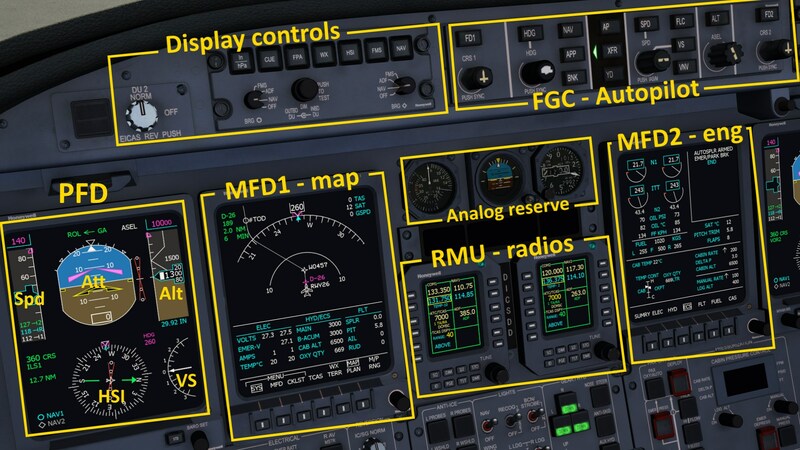 One can buy autopilot panels for simulators, to make your sim-flying more hands-on. Fig. 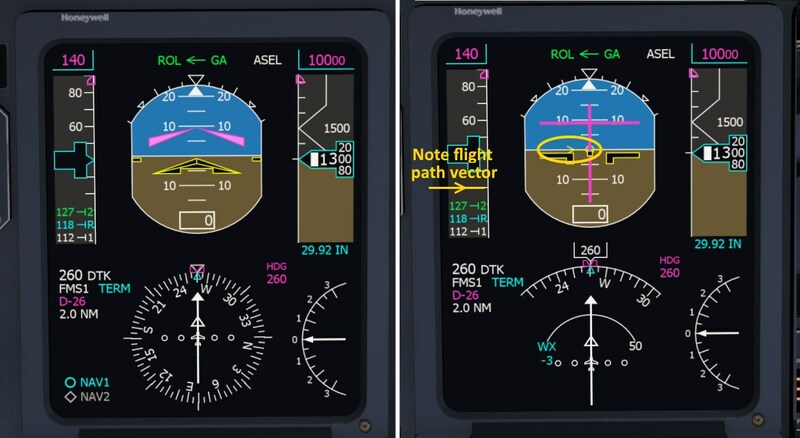 GoFlight Pro similar to Boeing 737 AP. Just buy, plug-in, and play! But is not cheap! Glass cockpit in aviation, Wiki eng. • Glascockpit i flygplan, Wiki sve.